Yellowstone National Park is one of the world’s most recognized parks. And it is for good reason. 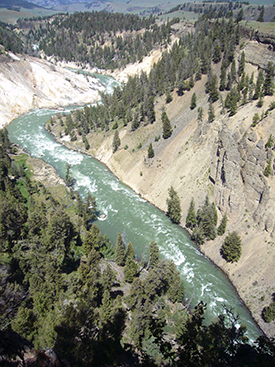 The park is a living lesson in geology and geological processes. Many visitors know about the famed geyser basin and Old Faithful geyser in the western part of the park. 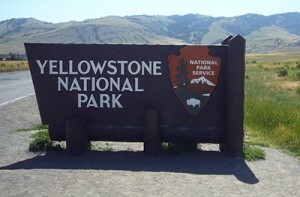 But the park is also well known for its famed wildlife such as bison, elk, bighorn sheep, and grizzly bears. The park has so much to offer visitors beyond the geysers and wildlife. Yellowstone is a dormant volcano. Much of the park is within the very large caldera, about 30 miles by 45 miles in size, and visitors can safely experience the geysers, hot springs, and bubbling mudpots. Beyond the geyser basin, the park offers a large forest of lodgepole pine and Yellowstone Lake, North America’s largest mountain lake. 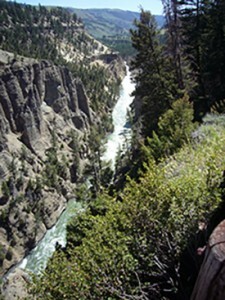 To the north of the lake, the Yellowstone River forms a remarkable canyon known as the Grand Canyon of the Yellowstone, with waterfalls and stunning vistas near Canyon Village. Near the Wyoming-Montana border at Mammoth Hot Springs, visitors can see a wide range of geothermal features amazing terraces of travertine that offer colorful photography opportunities. Visitors to this part of the park, close to the North Entrance at Gardiner, Mont., can visit the Albright Visitor Center for exhibits and history lessons and see former U.S. Army buildings of Fort Yellowstone, used when the Army protected the park in the late 19th century and early 20th century. The park offers numerous activities. Visitors with limited time can simply drive the loop roads in a day or two. But they will not see nor experience as much as stops along the way allow. Visitors will see much wildlife and sometimes experience bear or bison “jams” along the roads. Keeping a safe distance, there is much to see when observing bison and other animals in their natural environment. Visitors will find camping facilities, fishing in rivers and in Yellowstone Lake, hiking trails, wildlife watching, bicycling in areas such as the geyser basin, picnicking, horseback riding, and countless vistas for photographers. In winter, there are even more seasonal activities such as cross-country skiing and snow-shoeing. We invite you to take a look at our work. And we hope you will enjoy our stories, photos, and multimedia from our visit to Yellowstone National Park, West Yellowstone, Mont., Gardiner, Mont., and other places in the states of Wyoming and Montana. And we hope we provide some helpful ideas for your own visit to the park.